In a world where we are bombarded daily by voices from our phones, TV’s, and radios, sometimes it’s good to put them all down and listen to some voices from the past. My friend Andrew Kaiser has just published an e-book that allows us to do just that. 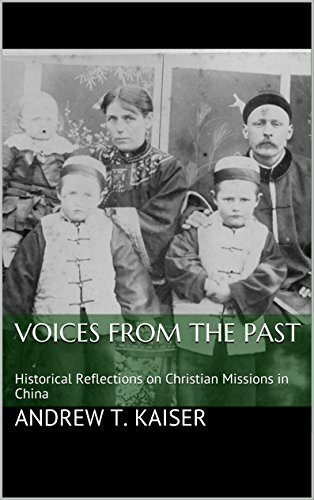 Voices from the Past: Historical Reflections on Christian Missions in China is a collection of 30 extended quotations from past missionaries in China. Over the years, the words of wisdom contained in the letters and diaries of these spiritual ancestors have profoundly shaped my own sense of purpose and calling, informing my identity and my life and work in China. This booklet is an attempt to share these lessons from history with other expatriates around the world who are committed to building God’s Kingdom in China. The quotations contained herein were chosen for purely subjective reasons, betraying my own struggles and interests. The selections are arranged in no particular order, with only the briefest comments added to provide sufficient context for understanding. Readers are encouraged to linger over each quotation, perhaps reading only one entry a day, and to spend time afterwards in prayer, reflecting on the theme in light of their own experiences. Whether you are serving in China, thinking about serving in China, or are just interested in a broader historical perspective of the history of Christianity in China, this book is for you! And here’s the great news — it’s only $0.99 on kindle!